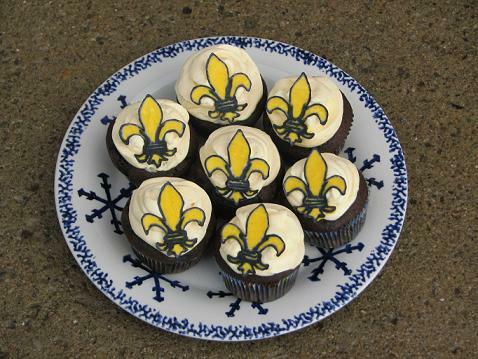 I have no idea why but the Fleur-de-Lis is a symbol used by the Cub Scouts. I'm sure I could search out the information but I don't particularly care that much :P Kidlet had his Cub Scout Pack Pool Party last night so I made some cupcakes with the symbol. I used royal icing on wax paper to make them. The cupcakes are triple chocolate with buttercream frosting! These lovely cupcakes nearly didn't make it to the party! No, they were not in some tragic accident, I just read the start time incorrectly. See, the POOL party starts at 8:15 pm but apparently the EATING started at 7pm. I didn't see that part and just saw the 8:15. I guess I am going to have to start reading these emails much more thoroughly. Luckily we still had lots of fun and the cupcakes went fast! Triple chocolate sounds perfect Jenn!